A simple answer to more time needed at the range, this inexpensive ammunition with the big brand name and proven history of reliability and value means you will be getting the best bang for the buck for range duty ammunition in bulk. 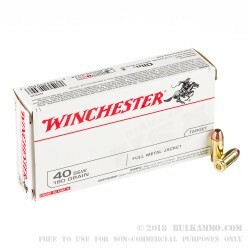 Winchester White Box .40 S&W ammo is a significant player in the mainstream shooting community for this caliber. It simply offers a no-nonsense approach to shooting that many shooters can get behind. That is: cheap ammunition that doesn’t shoot like cheap ammunition. The wide distribution network, legacy machinery and timeless production protocols of the Winchester brand name means the economies of scale can work in favor of the bulk shooter that just wants reliable, consistent ammunition that doesn’t cost your first born. 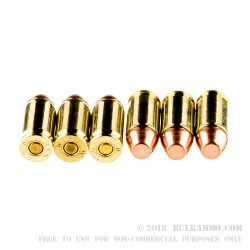 A moderate load, this 180 grain .40S&W projectile is a FMJ design with decent performance numbers of 1020 feet per second velocity and offering a fairly substantial 416 ft. lbs. of energy at the muzzle. This is enough to make the round function in a wide variety of firearms. The package offers a good volume to comfortably shoot for short range trips, with 50 cartridges in each box. 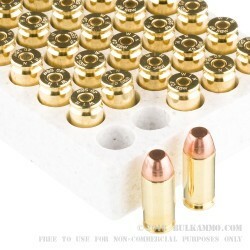 I put 300 rounds of this ammo through my glock 22, gen 4. Almost every mag I had an issue: Either stove-piping or wildly inconsistent ejection made for a miserable shooting experience.